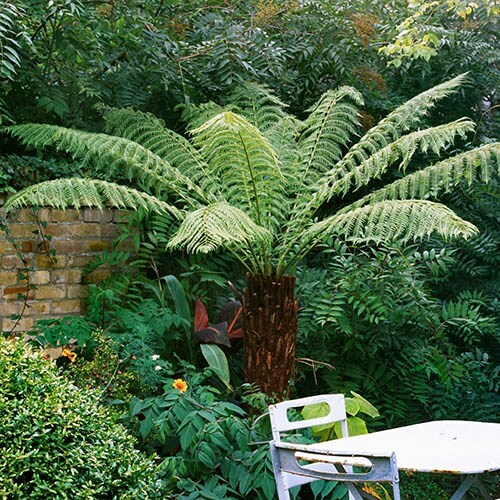 Fabulous garden impact, their huge fronds will reach up to 3ft long this year! Supplied as a 60cm dry trunk log, over 20 years old, with fronds about to emerge. Pot up or plant in the garden on receipt, and keep cool and centres well watered.. Harvested under strict License from woodland clearance in Australia and Tasmania, and in very short supply this season, these astonishing plants really will delight and amaze. They grow under the woodland canopy, in the shade, so grow them here in a sheltered spot too. These '2 foot' (60cm) logs are at least 25 years old, and have been cut back and harvested dormant. When you water them via the top crown, they will burst back into life, like it's the new rainy season! Because they grow in leaf canopies, most of their food comes from leaves falling into their giant shuttlecock like fronds, funnelling the goodness into the growing crown. Feed and water this crown - rainwater is best if you can collect it. Even at this size of log, new fronds of 1M in length will unfurl spectacularly within a Month or so of you watering it. The plant is hardy in winter, although the fronds will die back. Cutting these off when they die back is what creates the new trunk, which slowly inches up over many, many years. Keep the crown protected in winter with a layer of straw to keep cold and wet out. When you get it home, plant it in a big pot, or in the garden soil. It takes almost 2 years to root in, so do not be alarmed by this slow growing beauty. Supplied a a sawn log , harvested under License from Australian authorities, and each log has it's own permit and ID number. Plant in pots or shallow plant on gardens, and keep centre moist, preferably with rainwater. In later Spring season, fronds may well already be emerging form the top!